Tim Wright’s photo of the double-handed Pollux crossing the finish line under jury rig. Indeed several of the racing fleet has reported blown-up spinnakers, including Rainbow, who otherwise experienced little, if any, damage at all (read on). The cruising catamaran NDS Darwin arrived into their slip on I-dock with the top third of their spinnaker flapping like mad, the rest of it wrapped horrendously around the headstay. But it wasn’t just sails of course. Aboard the yacht Hada, 14 days into their passage, the excitement of the day was a broken turning block at the top of the mast. 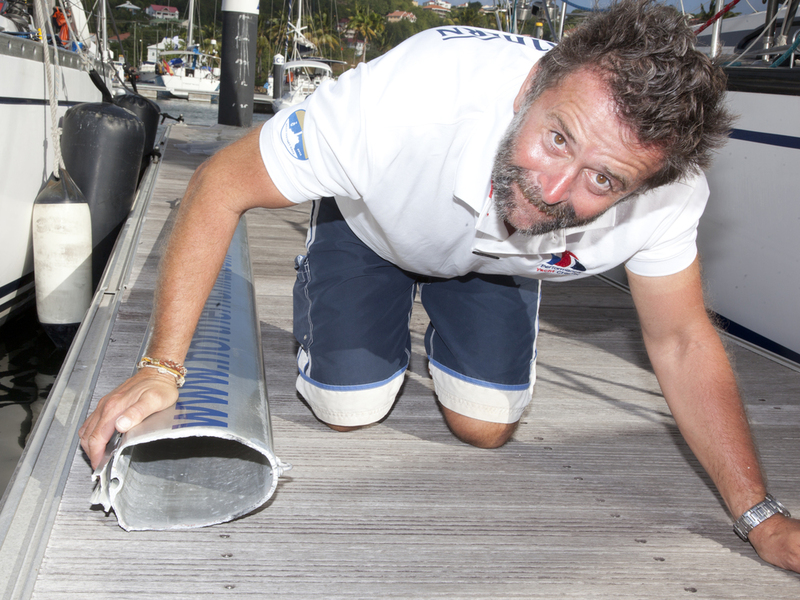 It was the block through which the spinnaker halyard was reeved, and needed to be replaced. In the end, the repair was successful, and Hada carried on as usual. In the racing fleet, boats were pushing hard and riding that thin line between going fast and light, and keeping the rig and sails together. In racing, there is a much finer line between ‘strong enough’ and ‘light enough’, and the boats generally carry a much higher risk of gear failure. But crews accept that risk in the name of speed. For some, it backfired. Intuition was only about 200 miles from the Canaries when their boom broke, a decidedly inconvenient failure with so much ocean in front of them. It would be a major handicap for the small boat that was pushing hard in the racing division and hoping for a good result. “Our boom just snapped in two pieces,” offered Vladimir, Intuition’s first mate. “I think this was a result of a very hard racing season,” he continued. That prep began in early April, with four Fastnet preparation races. That was followed up by the grueling Fastnet itself, a delivery from Hamble to Malta in the Mediterranean, then the Middle Sea Race and then the delivery from Malta to Gran Canaria. Both Vladimir and Alyssa offered no reasons as to why they thought the boom had broken, other than simply fatigue. The preventer was on at the time, but rigged from the end of the boom as is proper procedure, and the boom just buckled in the middle. The same thing had happened to an old spinnaker pole of theirs over the summer. “Our first reaction was just drop the mainsail, and rig a trysail. As soon as the boat was under control with the trysail, we just started to think what we could do.” Their first intention was to divert to the Cape Verdes, but they persevered. “We soon recognized that we could manage without the boom,” said Vladimir. 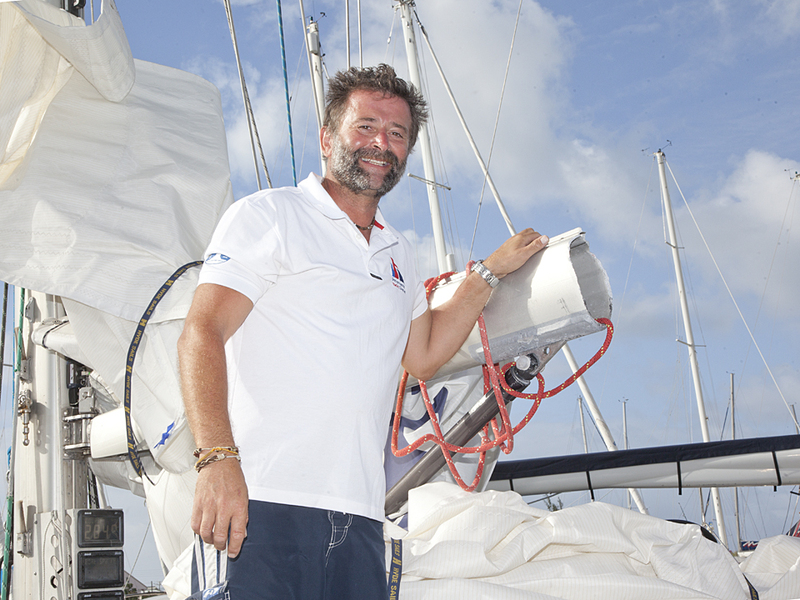 Intuition, in the end, finished in St. Lucia after a 20-day passage. They never started the engine, and while it might not be as high as they’d hoped for, they will get a result in the racing division thanks to their determination and resourcefulness. They’ve got nearly two months now to sort out a real repair before the Caribbean 600, their next race, starts in Antigua. Pollux, the small French Pogo, suffered arguably the worst damage. 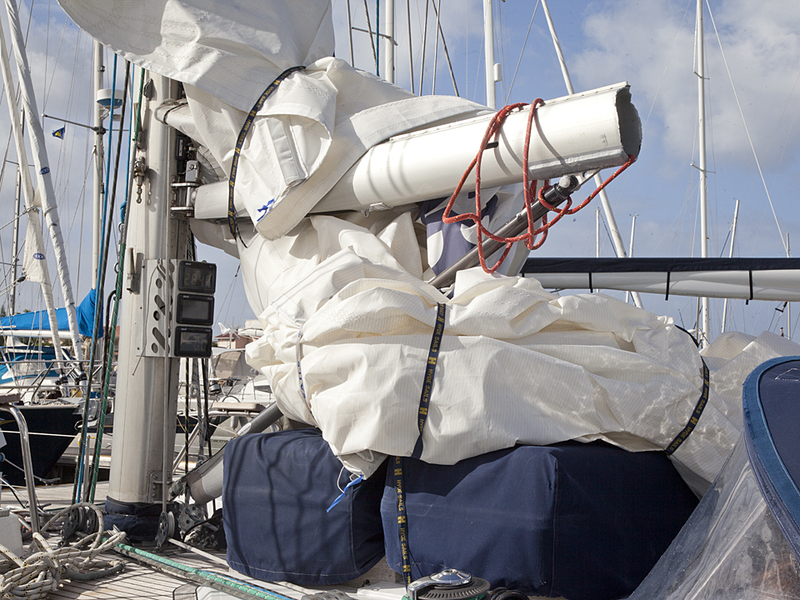 Only 140 miles from making landfall in St. Lucia, Pollux was dismasted in a heavy squall. The double-handed crew didn’t panic, however, and carried on with repairs. The top half of the mast, above the single-spreaders, had given way and went over the side. But the bottom remained. Pollux’ crew ingeniously rigged a windsurfing sail as a jury jib, and fashioned a makeshift mainsail by hoisting the clew of the sail and using what used to be the foot as the luff, sheeting it as best they could to the end of the boom. It helped that the final 140 miles of their crossing would be downwind. Remarkably, they made over six knots under jury rig and crossed the finish line on the morning of December6, not far behind their original ETA. There was plenty of damage in the cruising division. Thomas Wibberenz, a rep for Parasailor who annually makes the trip to both Las Palmas and St. Lucia to help clients prepare for the passage and clean up afterwards, says he’s seen more damage on the docks in 2013 than in recent years. As for how to prevent these kinds of breakages in the first place, Thomas tells all his clients to simply be careful. “Watch out for chafe, and keep everything from moving at all,” by using preventers and sheets and guys, he says. The Island Packet 485 Free Spirit was doing their best to do just that when their furling line failed and their genoa split in the middle of a strong squall less than a week into the passage. Skipper Peter Harris was down below on the off watch when the helmsman called for backup as the wind increased. The line failed, the full genoa unfurled, and the sail – an old one, already damaged and repaired several times previously in fact – ripped across it’s girth in two places. Then, in another squall, the sail finally gave up the ghost for good, again when the furling line jammed. This time, the crew was able to just roll up the sail altogether, though by then it was in tatters, and they were only six days away from making landfall in St. Lucia. “I decided just to park her on the forestay until we got here,” Harris said. The strong winds and heavy seas that much of the fleet has been reporting in the last 72 hours prevented them from doing much about it, and the sail started tearing itself to pieces. For all the carnage on the dock, there were plenty of boats who had relatively drama-free passages, reporting only minor wear and tear and in some cases, no breakages at all.